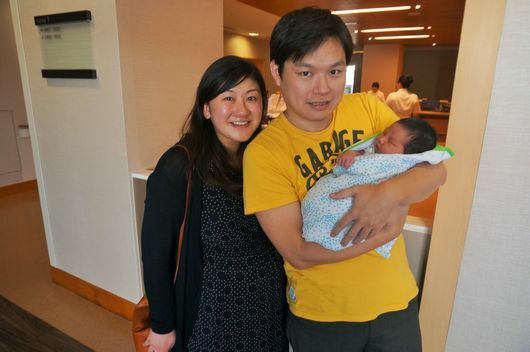 It had certainly been a long wait for baby Ethan a.k.a ‘Maxi’, finally arriving early on the 21st July 2014. Wai Kuan already started to feel like baby will pop out any minute the week prior to this. In fact, we actually already booked in to head to the hospital on the 21st July 2014 for induced birth, as scans did show that our little ‘Maxi’ was getting a little big (~3.6kg). As if little ‘Maxi’ heard the conversation, he decided to break mummy’s water early on the evening of 20th July 2014 (On a Sunday) at about 6:00 pm. And so the adventure and a new life for both of us begun…. 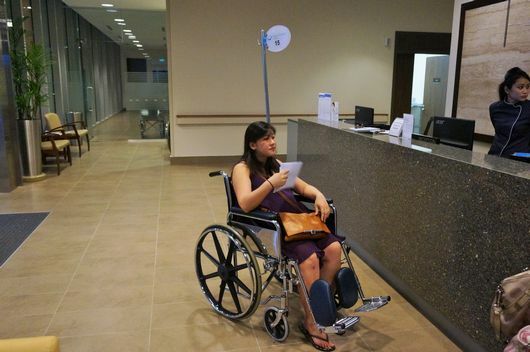 Believe it or not, mummy even had enough time to shower, and to pretty herself up, before she was rushed to Mt Elizabeth Novena hospital in an Uber Exec van by about 7:10pm. The hospital was rather quiet though, which was probably a good thing. We chose this hospital, as it’s very new, and it doesn’t ‘smell’ like a hospital. So in theory, we assumed the service would be good. Requesting a wheelchair was a breeze, and she was promptly wheeled to the delivery suite..
She was then induced with plenty of drugs (i.e. epidural)… as the contractions were starting to hurt. Even with all those drugs, it was apparently still painful. 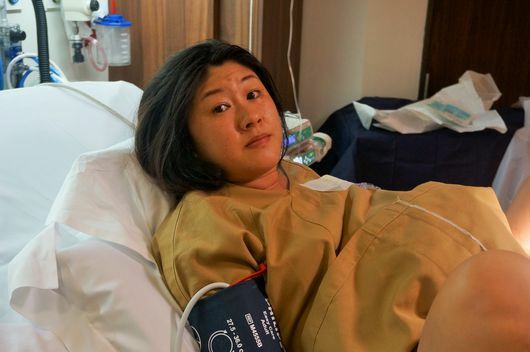 By 12pm (midnight), Wai Kuan was already fully dilated ready for baby to be pushed out.. Dr. Anthony (her obstetrician) didn’t actually arrive until approximately 3:30am. Disappointingly though, after an hour of pushing.. there was a slight ‘Houston.. we have a problem’ moment..
What happened? Nothing…. yeah.. absolutely NOTHING.. what an anti-climax. Maxi was just too big to be pushed out naturally. 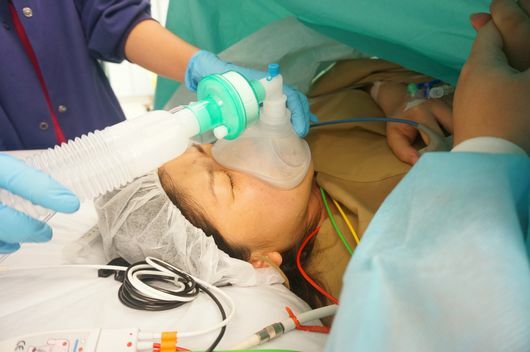 Mummy was getting too tired, and was developing high temperatures (39 degrees) from the epidural drugs. 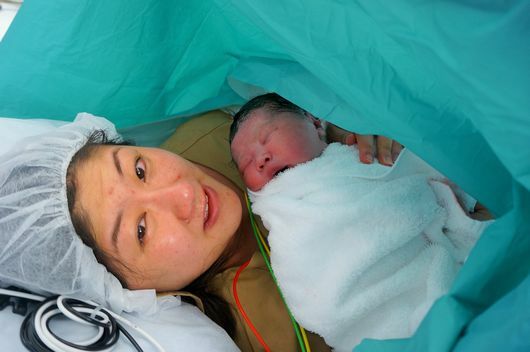 Her obstetrician, Dr. Anthony Siew, recommended that we proceed with emergency caesarian instead. That was about 4:50am. Of course, there were documents to sign our life away before the process will actually begin. 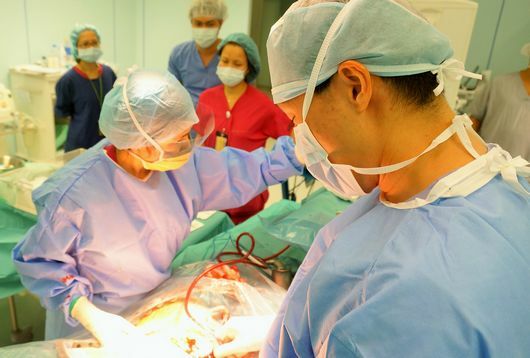 Once done though, a magical team appeared out of nowhere in full ER suits, who came rushing into the delivery room and dragged her into the emergency operations theatre. It all happened so quick and swiftly in front of me, and was probably the first time since we started to visit him on a regular basis (since December 2013), that I could fully appreciate and justify the amount we were paying for Dr. Siew’s service! In far less time than a full episode of ER.. baby ‘Maxi’ was out by 5:09am.. What can I say? 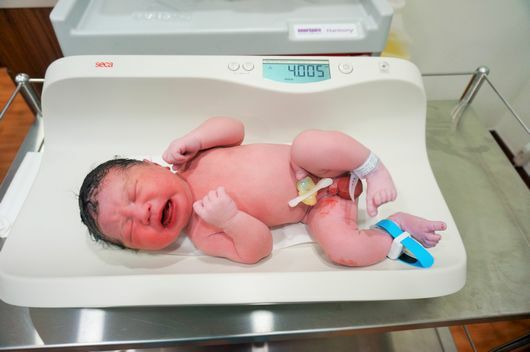 There was this magical moment from seeing the baby appearing in Dr Siew’s arms out of nowhere, to the baby jumping to life with its crying that literally changed and amazed me. Perhaps ‘fatherhood’ kicked in? Before mummy and daddy even get to have a full moment to enjoy the union and a brief photo together, the surgery team whisked daddy and Maxi away. Mummy was gassed (probably because they sensed that she was getting nervous), and the process to stitch her back up began from then on. Daddy was ushered, along with the baby to the ICU (Intensive Care Unit) where the baby was cleaned up. At this point, the ‘delivery’ was declared complete @ 5:30am. 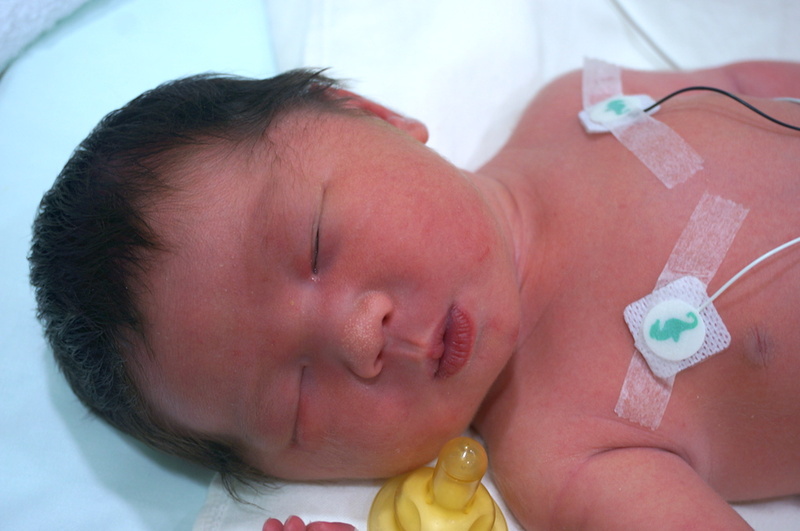 The on-call pediatrician (Dr. Mark Loh) felt it was necessary for the baby to be monitored in ICU as his temperature was relatively high (39.1 degrees from memory). Thankfully it was nothing major, as the temperature returned to normal not long after. Daddy was then again whisked away (hard life!!) to the ‘ward’.. *cough*.. hotel.. where we stayed over the next 4 days. Whilst mummy got a nice big bed with fancy controls.. daddy got a couch for his bed! 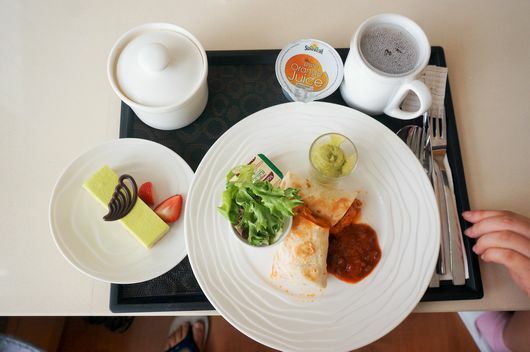 If there was one thing worth raving on about the hospital here (at least from my perspective), it’s that the food here was definitely ‘gourmet’ by hospital standards (and well above most lower end restaurants, and certainly most airline food in Singapore!). Mummy got the ‘confinement’ food selection, while I got to choose from a selection of Chinese, Western, Malay and vegetarian cuisines for every single meal. The tasty food certainly helped made the stay just that little bit more memorable. Having said that, we were both still hungry after most meals. I had to occasionally sneak out to Novena Square 2 Shopping Centre next door to ‘top up’ a little. It didn’t take away the fact the food was really really tasty! With ‘Maxi’ in the ICU for 2 days, we were relegated to paying him a visit a couple of times a day. Mummy had to be wheeled there, given she was still recovering from the caesarian operation. 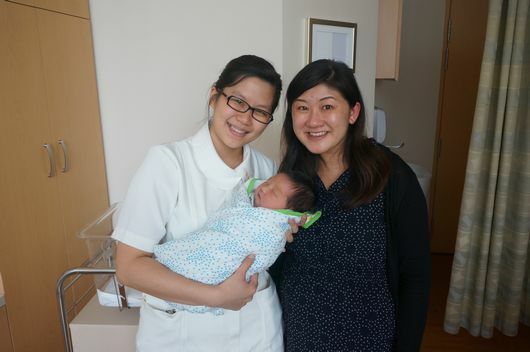 We really only got the chance to have baby Ethan spending time with us in our room on the last day/night, when our pediatrician (Dr. Mark Loh) let him out of the ICU. All in all, it was a pleasant experience, albeit an expensive one. Mummy had started to collect all the receipts and bills too in a folder for baby Ethan/Maxi to ‘review’ when he grows up!! 🙂 Regardless, we’ve been warned of endless sleepless nights, dealing with non-stop crying, cleaning up poop/pee and handling tantrums. Haven’t heard anything positive yet, but all we know for now, is that when baby is asleep or looking at us with his curious eyes, there’s this soft bit in our hearts that say, ‘We love you.. baby Ethan’. This is one of those post that I hope ‘Maxi’ will one day appreciate if he ever gets to read this. A lot of time/effort/money went into delivering ‘Maxi’, and the details would hopefully still be captured and remembered long down the track. That’s my aim at least. Yes we are first time parents. Don’t know if we will be good parents or not, but looking forward to spending the next chapter of our lives with this new little bundle of joy! !